I've always loved the idea of making pizza from scratch but for some reason I thought it would be very difficult. Last week I tried making it for the first time and now I want to make it every week! It's so much easier than you think and knowing you've made it, makes it taste a lot nicer. So lets get cooking!! First you want to add your flour and salt into a big bowl. 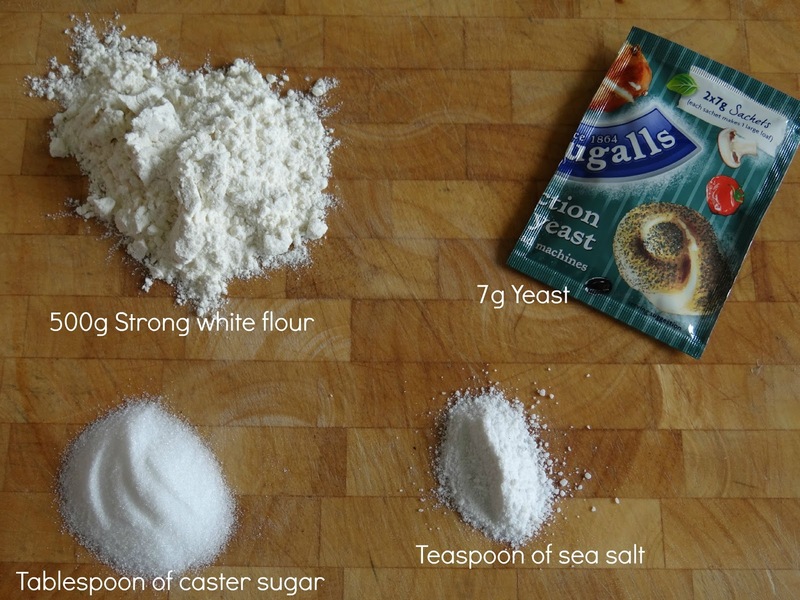 Now you will add your yeast and caster sugar into the luke warm water and stir with a fork. Don't worry if it doesn't dissolve,it will be a bit lumpy. Next you will make a hole in the middle of the flour and pour the liquid in and stir with a fork until it begins to stick together. Before you take it out of the bowl make sure you flour your surface.Then take it out and mould it together. You will have to knead your dough for at least 10 minutes, until it looks a bit like this. Then you want to rub some olive oil around a clean bowl and pop your dough in and cover it tightly with some cling film. Leave it to proof for 1 hour. You will know when it's ready because it would have doubled in size. Now you want to flour your surface yet again and start rolling it out. There is no method to rolling it, you can have it as thick or as thin as you want. Now for the best part..the toppings! You can put whatever you want on your pizza, you can have it veggie or meaty or simply just plain cheese. These are the toppings I choose. I also cheated with the sauce because I used a pre-made pasta sauce but you can make your own tomato sauce if you want. Now all you need to do is decorate it how you want and pop it in the oven for 15 to 20 mins and enjoy! Thanks for reading this weeks post! Hope you enjoy making your own tasty pizzas.